Pure Water Window Cleaning specialise in cleaning business premises, office buildings and glazed industrial units in the West Midlands area. 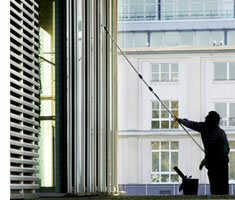 Based in Coventry with over eight years experience, we use a professional hot water fed pole window cleaning system. All we use when cleaning windows is pure water which is made more effective by our unique water heating system. Pure Water are fully compliant with current Health and Safety Regulations and use the latest water fed pole reach and wash technology to clean your business, office or premises. For more information call 0800 055 6880 or Enquire online. The water we use to clean windows is purified via a filter system and therefore dries streak free without leaving any residue. Pure water is pumped up a telescopic pole to a brush which cleans the window. The window dries clear and streak free because there is no residue left behind. To further improve the cleaning performance we heat the water which is far more effective in removing dirt and grime from your windows. 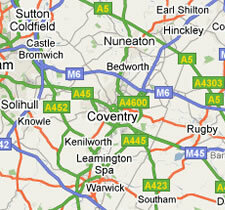 Our service extends to all areas of the West Midlands including Coventry, Nuneaton, Rugby and Solihull. Our main clients include city centre offices, pubs, hotels, shops, car dealers and restaurants plus may companies on who operate from glazed industrial units. For more information call 0800 055 6880 or Enquire online.